Going into the 2018 season, Real Salt Lake’s success depended on a few key signings and the growth of their young talents. Both were mixed bags. Heading into 2019, that mix will tilt more heavily toward their youth, as RSL furthers their dependence on an ability to raise and develop young prospects. The last 24 months for Real Salt Lake have been quite the saga. A solid CCL run in early 2016 ended in the semifinals against Tigres, which was followed by a disappointing 2016 season. That was followed by terrible start the 2017 season, but then led to an inprobable late run at the playoffs. Gone are the years of peak Kyle Beckerman and Nick Rimando with a magnificent Javier Moralez leading a jewel of an attack. But here again are the days of a potent Real Salt Lake built upon a staunch defense force and skilled playmakers. Much of the cast has changed, but the style has been reborn. The abysmal 2015 season for RSL was predicated on the failure to adapt to a new formation and lack of offensive depth. In Jeff Cassar's second season in charge of RSL, the team managed to compile anemic attacking numbers. Transitioning from a 4-4-2 diamond formation that seemingly defined RSL through the Jason Kreis era, the new shape exposed some players that were previously pivotal components to RSL's consistent success in the past. Both Kyle Beckerman and Joao Plata were sluggish to figure out how to thrive in a new shape and struggled with their new identity, but for different reasons. As Beckerman ages, the expectation is that his motor will slow, his poor first step and general quickness will get even worse, but his game IQ and game management skills will improve. The issue with the attempted 4-3-3 shape is that the single, central midfielder is burdened with a more intense physical workload because of the vertical space that is now only occupied in front by the central forward in the middle channel. 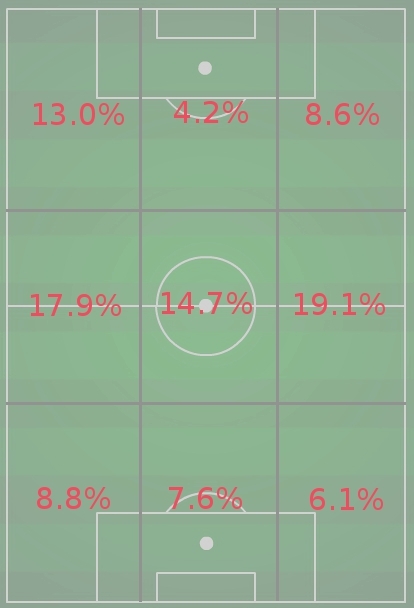 Beckerman struggled with the spatial requirements, his significant numbers have been declining for the past three seasons, and was ultimately exposed in the middle of the park. Set for another terrorizing season in the final third, Plata came back from being injured during the beginning of the season and never found his feet in the new spacing. Although he seemed to thrive in open space, the lack of connection and compactness saw him struggling on isolated islands through many of his appearances. Our projections for 2016 after the jump. The USMNT held off a confident and gritty Honduras team and started Group A play in the CONCACAF Gold Cup with a 2-1 victory. Jurgen Klinsmann’s side was not sharp, holding less than 50% of possession against a team that was sitting back in a 5-4-1 formation, but they earned two goals off set pieces that found the magnificent head of Clint Dempsey, and broke up enough counterattacks by Honduras to survive. The U.S.A.’s struggle with possession was part Klinsmann, part poor play and, of course, part Honduras. The troubles started tactically with Michael Bradley being placed at the top of the 4-4-2 diamond formation. The usually strong possession link between Kyle Beckerman and Bradley was broken up leaving the shuttling duo of Gyasi Zardes and DeAndre Yedlin to bring it back together. Both players are playing in an unnatural role and are not possession oriented players to begin with. Couple the midfield issue with just 50% pass completion percentage from right back Timmy Chandler and you have the recipe for a choppy performance. On July 7th the United States Men will play their first competitive match in nearly a year, and in so doing begin their defense of the Gold Cup. A successful run through the final in Philadelphia would guarantee their place in the Confederations Cup in 2017, and confirm them as the dominant force in CONCACAF. Failure to win would not be the end of the world, but it would put a damper on the momentum the team has recently built with a positive World Cup run followed by overall strong performances in this cycle’s friendlies. In the end, a Gold Cup win keeps the U.S. on Jurgen Klinsmann’s aggressive path to improvement. An exit of any kind will start to raise doubts if the team has the talent to make a serious run this cycle. The top story around here about Real Salt Lake revolves around its ability to frustrate me. Over the past two seasons, RSL has led the league in scoring more goals than our model expects it to, and in allowing fewer goals than our model expects it to. So what’s in the water in Utah? Nick Rimando is in the water. Over the past three seasons, Rimando has made saves valued at more than six goals per season better than average. ** Using a simple regression, we can estimate that those six goals in a season were worth about four additional points for RSL in the standings each year. Not bad for one player. Offensively, we've shown that outperforming expected goals becomes a stable metric as the season progresses. The only question is, how does RSL do it? Perhaps of importance, its offense is extremely slow and methodical relative to other teams. According to Tempo Free Soccer, RSL was third in the league in 2014 in passes per possession (PPP) but dead last in possessions per game (PPG). There is certainly a correlation across the league between PPP and outperforming expected goals, indicating that perhaps long possession (by number of passes) frees up players for shots with more time and space. Or maybe teams that are capable of creating time and space know that they need to pass the ball around enough to find the right opportunity. Either way, it’s clearly possible that RSL is such a team that has an ability to outperform its expected goals offensively. Between 2011 and 2013, striker Alvaro Saborio consistently outperformed his own expected goals by about two per season. In 2014, he started just 13 games and played 1230 minutes, making way for the four-foot-15-inch Ecuadorian, Joao Plata. Plata clearly appreciated his opportunity, producing 56 of his own shots and 13 goals in just 24 starts—6.5 goals more than expected, given his quality and quantity of opportunities. While Plata will likely regress some in the finishing department, it seems that RSL’s style fosters overperformance. It is still up for debate as to how much of this overperformance comes from each of team style, individual finishing, and random variation. Whenever the season actually starts, RSL will kick off with one of the best goalkeepers in the league once again in Rimando. We’ve talked about him already, but his backup may be one of the more undervalued assets on the team. Jeff Attinella made just below $50,000 in total compensation in 2014, not too far above league minimum of $36,500. Our keeper ratings show that he saved four more goals than expected last season, and while 10 starts is hardly a large enough sample size to conclude he’s a top goalkeeper, a history of success in the NASL suggests that he’s capable. Additionally, our own Will Reno projects him essentially as a typical starting MLS goalkeeper, and Tom Worville suggested that Attinella was an undervalued keeper using WhoScored data. For 50,000 bananas, RSL fans can be reassured that if Rimando were to go down, the season wouldn't be hopeless. This offseason saw the departure of two starters along RLS’s backline, Nat Borchers to Portland and Chris Wingert (and his classy tucked-in jersey) to New York City FC. They combined for 5,780 minutes, half of which will likely go to the prodigal son, Jamison Olave. Olave will replace Borcher’s position at centerback, but probability in a much different way. Olave features an athleticism that does not conjure up any images of Borchers, though it’s perhaps a reckless athleticism at times. Olave did accumulate eight yellow cards last season, exactly as many as Portland’s Diego Chara who is particularly known for such chicanery. Despite the physical differences, for what it’s worth, some of their statistical outputs are quite similar. Who will get those other minutes left by Wingert is up for debate, but Demar Phillips appears to be the frontrunner. The Jamaican international joins RSL from Aalesunds FK, a successful team in Norway’s top division. Also an option is the 26-year-old Abdoulie Mansally, who made 11 appearances with six starts last season. Both could provide a stronger offensive presence than Wingert from the back. Mansally was once a forward, and produced more xGoals and xAssists than Wingert on a per-minute basis in 2014, and Phillips has scored 12 goals for the Jamaican international team over the years, indicating some experience being offensive. RSL is known for its 4-4-2 lineup with an effective diamond midfield. It started four midfielders in every game but one last season, at least nominally. This is interesting because multiple sources suggest that RSL could come out in a 4-3-3 in 2015. After losing Ned Grabavoy to NYCFC in the expansion draft—in addition to a growing pool of forward talent—RSL may be rethinking its personnel and style. Last season the midfield quartet of Grabavoy, Javier Morales, Kyle Beckerman, and Luke Mulholland produced 15.5 expected goals and 16.2 expected assists in 10,581 minutes. For comparison’s sake, D.C. United’s primary middle four logged 10,359 minutes and recorded just 10.8 expected goals and 6.8 expected assists. Though it may not be completely fair to compare them to D.C. United, team style aside, it shows that RSL got a lot more out of its midfield than another successful MLS team that also played a 4-4-2. Regardless of formation, 2015 is likely to feature more of USMNT member Luis Gil and less of Mulholland. Mulholland outpaced Gil in shots and expected goals last season, but not by much once you consider that Gil played 500 fewer minutes. Just 21 years of age and getting USMNT experience, Gil is ready to start and play 2,500+ minutes. But the question remains, will RSL’s midfield be able to continue to produce high quantity and quality of chances in a new formation? Was Grabavoy more important to the mix than many thought? I don't have these answers, but perhaps 2015 does. Another reason for the potential formation change may have a lot to do with the emergence of Plata, Olmes Garcia, and Devon Sandoval as good young forwards, as well as the mid-season signing of Argentine striker Sebastian Jaime back in August. With Saborio returning from an injury-shortened season, RSL may feel that it can maximize production by simply allowing more forwards to play at once. The loss of Robbie Findley’s 822 minutes may not even be noticed. There was a focus Plata’s 13 goals and what he was able to do for RSL by scoring, but I noticed something else in his statistical line. He led RSL’s forwards in 2014 by far in key passes and expected assists with 48 and 5.7, respectively. Of course, he played more minutes, so how about this one: in 2,084 minutes, Plata recorded more key passes and xAssists individually than every other main RSL forward in a combined 4,294 minutes. *** Even if it starts three forwards in 2015, Real Salt Lake would have one that distributes enough to make it work well. Despite the losses of Borchers, Grabavoy, and Findley, among others, RSL definitely has the fire power to compete for a top three finish in the Western Conference, though that may not be the average projection. I feel that RSL’s success in 2015 hinges on its ability to make the midfield as effective as it was the past, whether it chooses to replace Grabavoy with a forward (4-3-3) or work Gil in with the remaining midfielders (4-4-2). Our predictive model from the end of last season suggested that RSL would be expected to finish essentially tied for fourth in the West with Portland, Sporting KC, and Vancouver. I think it's fair to project RSL to finish somewhere between 3rd and 7th in a tight Western Conference. **Check out our keeping ratings under the xGoals tabs! ***Includes Saborio, Garcia, Findley, Sandoval, and Jaime. The optimist looks at Real Salt Lake’s 2013 season and praises the club for making the MLS Cup Finals. The pessimist complains that they lost the MLS Cup Finals in penalty kicks despite holding a lead with 15 minutes remaining, facing a goalkeeper who seemed like his joints had frozen solid. The optimist praises the club’s performance in the U.S. Open Cup, lauding their run to the finals. The pessimist complains that they lost in the finals against DC United, a dreadful team. The optimist praises the team for finishing with a 16-10-8 record and a +16 goal differential in the regular season. The pessimist complains that they failed to win the Supporters Shield (again!) by 3 points. For Real Salt Lake in 2013, perception was everything. 2013 Finish: 16-10-8, 56 points; 57 GF, 41 GA. Second place in Western Conference. Lost in MLS Cup Finals. Roster Churn: RSL returns 90.5% of its minutes played in 2013 (1st in all of MLS). In early 2013, Real Salt Lake owner Dell Loy Hanson made the decision not to extend Jason Kreis’s contract, gambling that Kreis’s stock would come down and he would be able to nab the coach at a bargain price. After all, the club had just lost Will Johnson, Jamison Olave, Fabian Espindola, and Jonny Steele in an offseason filled with cost-cutting moves. 2013 seemed likely to be a rebuilding year. Twelve months and two cup finals later, Jason Kreis is preparing for the 2015 debut of New York City FC, leaving Jeff Cassar, promoted from assistant coach, to lead Real Salt Lake. Cassar, with the team since 2007, is a safe choice, but even with all 11 starters returning, he may find it difficult to replicate the kind of success that RSL achieved under Jason Kreis. Nick Rimando returns to man the RSL nets for the 8th consecutive season. There’s nothing much that can be said about Rimando that you probably don’t already know. A 14-year veteran of the league, Rimando has ascended to third in command of the United States net. Remarkably, Rimando has a 10-0-0 record with the U.S. team, and is already tied for 5th all-time on the goalkeeper victory list with Brad Guzan. Rimando’s national team opportunities have come as a result of stellar club play. Last season, he finished 2nd to Donovan Ricketts in Goalkeeper of the Year award voting, and was probably unlucky to do so. Rimando really is the total package: His reflexes and shot-stopping ability are legendary, and while it may not surprise you that Rimando finished 4th in pass completion percentage, the diminutive Rimando is also an excellent commander of his penalty area. In 2014, Rimando finished 4th in MLS in catches per 90 with 2.63. This paragraph is far too long for one that could have been summed up simply with "Real Salt Lake is in good hands with Nick Rimando." With Chris Wingert, Nat Borchers, Chris Schuler, and Tony Beltran patrolling in front of him, Nick Rimando, too, will be in good hands. In the playoffs, Borchers and Schuler showed the potential to become one of the best pairings in the league. Though that is contingent on whether Schuler can remain healthy. In both the 2012 and 2013 seasons, Schuler was sidelined for multiple months with a foot injury. It was evident just how much Salt Lake missed Schuler last season when he was injured: with Schuler on the field last season, RSL conceded only 0.94 goals per 90, without him, they conceded 1.45 goals per 90. Yes, the sample size is small, and no, these numbers do not take into account opponent and location of the game. Still, Schuler’s contributions to defense were evident when 20-year old Carlos Salcedo was forced to step in. Nat Borchers provides much more certainty. In his 9-year Major League Soccer career (he spent two years with Odd Grenland in Norway), Borchers has averaged more than 28 starts per season. However, for all they do defensively, it may be their contributions to the attack that makes the RSL backline so valuable. Nat Borchers is one of the calmest defensive distributers in the league. Last season he had the 3rd best pass completion rate in the league, behind only Osvaldo Alonso and George John. This may be because Real Salt Lake puts a premium on possession and building the attack from the back, which sees Beckerman and the rest of the midfielders providing outlet options constantly. The team led MLS last season in possession percentage, pass success percentage, and percentage of passes that were under 25 yards. After all, Kwame Watson-Siriboe finished with a 93% passing rate (in but a mere handful of games), and Carlos Salcedo and Schuler both finished above 80%. Wingert and Beltran involve themselves in the attack as well, though not always in the traditional, bomb-down-the-flanks-and-send-in-a-cross manner. When Real Salt Lake is in possession, the two outside backs (and Beltran especially) inhabit an advanced position on the field, where they can combine effectively with Gil, Grabavoy, Morales, and Saborio. Beltran is the more threatening of the two outside backs, finishing last season 5th in the league in key passes among defenders with 25. The midfield will look awfully familiar for RSL fans this season as well, and why shouldn’t it? No midfield quartet in MLS can control the pace of the game like Kyle Beckerman, Ned Grabavoy, Luis Gil, and Javier Morales. Beckerman provides the transition from defense to attack, from left to right. He does it often, and he does it well. The only midfielder with more passes than Beckerman last season was Marcelo Sarvas, who had 3 more passes than Beckerman, though the Galaxy midfielder did it in 610 more minutes. Beckerman was the runaway leader in passes per game with 69.7, nearly 10 more than number two on the list. And though better known for his grit and tactical nous, Beckerman also manages to throw in no-look assists from time to time, just for fun (and to [almost] win MLS Cup). Number two on that list of passes per game in MLS last year? None other than Javier Morales. Though he always has a target on his back, the 34-year-old Argentine playmaker often drifts wide and deep to ensure that he sees enough of the ball. And when he gets the ball, RSL benefits. Last season, Morales finished (per game) in the top 10 in fouls suffered (1st), key passes (2nd), successful through balls (4th), and successful crosses (6th). These numbers are gaudy enough, but numbers like that are often indicative of a high-risk style of play, sending in large numbers of passes and crosses to in the hopes that a few of them will lead to dangerous scoring opportunities. 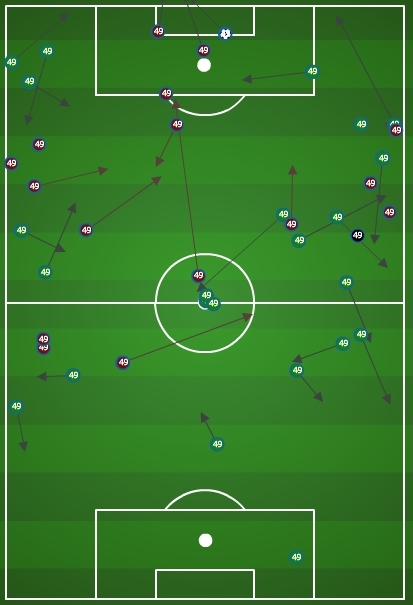 And while he does send in a lot of passes (Morales has attempted [2,327] and completed [1,857] more passes in the opponent's half than any other MLS player over the last two years), what sets Morales apart from his peers is his effectiveness. While the average pass completion percentage of the rest of the top ten “key passers” (all attack-minded players) in 2013 was 76.6%, Morales’s was a hearty 83.1%. This number is inflated a bit both because he plays on such a talented, possession-oriented team and because he receives the ball farther from goal than, say, Thierry Henry or Robbie Keane, both of which lead to more safe ball touches. But even with these advantages, Morales should be regarded as one of the most talented players in the league, one who was unfortunate not to have been included in the MVP race last season. The rest of the midfield will be rounded out by two of the most underrated players in the league. Gil gets more publicity than Grabavoy. He did when he signed with Major League Soccer amid rumors of pursuit by clubs like Arsenal, and he does as a 20-year-old who has caught the eye of Jurgen Klinsmann. Gil deserves his plaudits, of course. After all, how many MLS players have played in 84 games before their 20th birthday? (By my count, just Freddy Adu and Eddie Gaven, though others, like Diego Fagundez, should get there). But how many times have you heard Ned Grabavoy referenced recently? If you listen to the media or fans, probably not very many, but if you’re taking note of the play-by-play man on an RSL broadcast, you probably hear it quite often. 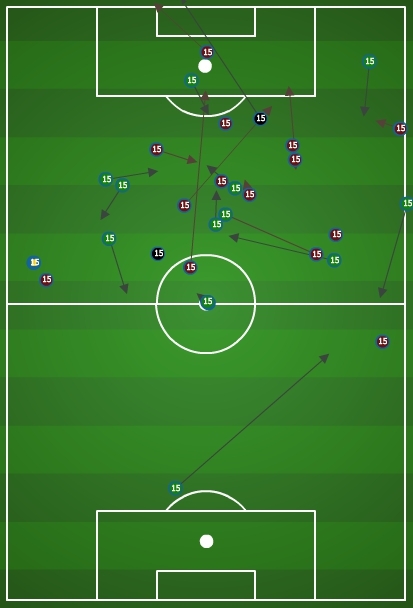 Grabavoy is everywhere on the field: relentlessly pressuring the ball (he finished 14th last season in tackles per game among midfielders), and then quickly and efficiently--far more than he gets credit for (86% pass completion rate, 4th best in MLS)--distributing it. Remarkably, despite all of Grabavoy’s defensive grit, he finished tied for 6th among MLS midfielders in fouls suffered with 63 (9th in fouls per game with 2.0), and committed only 37 himself. If that’s not enough, he pitched in with 5 goals on only 29 shots, intelligently taking 20 shots inside the box versus only 9 outside. Up top, Salt Lake will deploy their preferred pair of Alvaro Saborio and Robbie Findley. Saborio may be the most indispensable member on the RSL squad. He has scored at least 11 goals in each of the four seasons he has been in the league. Last season, due to injuries and international call-ups, he only managed 15 starts, yet still racked up 12 goals. His .80 goals per 90 minutes led the league. Findley will provide support for Saborio. He may not have the greatest skill on the ball, but his pace down the channels draws defenders out of position and opens up space for Saborio and streaking midfielders. However, if Findley gets off to a slow start, he’ll have to watch his back. Last season, the trio of Olmes Garcia, Joao Plata, and Devon Sandoval, three very different types of forwards, all showed promise, and will be looking for even more playing time this season. This preview has featured incessant, nearly sycophantic levels of praise for RSL players, but years of success despite shuttling players in and out of Utah to stay under the salary cap suggests that maybe it’s the system just as much as it is the players. After all, when Sebastian Velazquez filled in for Luis Gil, he looked great. Same for Yordany Alvarez for Ned Grabavoy. Joao Plata, Robbie Findley. Sandoval, Saborio. How much of the success of RSL was because of the system? How much of the system was based on Kreis’s presence? American Soccer Analysis readers seem to think that the team will not have quite the same success this year. They have projected RSL to finish 4th in the Western Conference this season, with 20.69% of voters placing them there. Although very few people think that they will miss the playoffs entirely, with only 13.05% of voters placing them in spots six through nine. Throughout the match, Real Salt Lake's defensive shape remained resolute, and never came close to being broken down by Portland's 4-3-3. Kyle Beckerman was, as ever, the linchpin of RSL's midfield, leading the team in aerial duels won with 6 (of 7) and tackles (4, tied with Tony Beltran), and contributing 6 clearances. However, the incessant pressure of Sebastian Velazquez and Luis Gil—who it should be noted are 19 and 22 years old, respectively—along with the fullback pairing of Beltran (who led RSL in touches with 76) and Chris Wingert/Lovel Palmer, never allowed any space for Diego Valeri or Darlington Nagbe to work their magic in the midfield. Many of Portland's forays into the penalty area stemmed from Rodney Wallace collecting the ball in wide positions and sending in listless crosses (0-for-6) that were easily dealt with by Nat Borchers. Forward Ryan Johnson was kept in check all game, limited to a mere 18 touches in his 59 minutes on the field. The entirety of Portland's productive offensive output consisted of Will Johnson's free kick goal, Piquionne's soaring headed goal, and a 77th minute shot from Alhassan after a slick dribbling spell through the heart of RSL's midfield. For the entire game, Portland had only two successful dribbles and three successful crosses in the attacking third (one of which was Jewsbury's beautiful assist). The only change in the starting lineup for Real Salt Lake to start the game was Devon Sandoval replacing an ailing Alvaro Saborio. While few would argue that Sandoval is the better player, his kinetic style, defensive workrate, and ability to get into wide spaces provided problems for the Great Wall of Gambia. As you can see, the defense starts from the front. Sandoval pressured wide all game long, trying to disrupt Portland's rhythm in the defensive half of the field. Of Sandoval's 43 actions against Portland, only 11 (25.6%) took place in the center third of the field, compared to 15 of 28 (53.6%) for Saborio against Los Angeles. Sandoval also pressured back more than Saborio did: 8 of 43 (18.6%) actions by Sandoval took place in RSL's half of the field, compared to a meager 2 of 28 for Saborio (7.1%). What really stuck out about the way that Real Salt Lake played, however, was the way that their midfield “diamond” stretched from touchline-to-touchline, with Velazquez manning the left, Gil hugging the right, and Morales drifting from side-to-side, looking for an inch of space wherever he could find it. 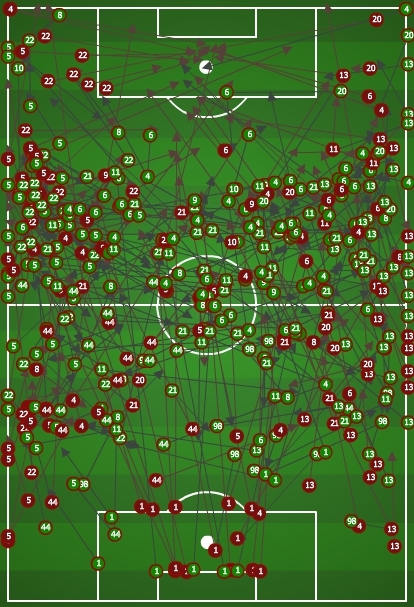 Real Salt Lake attempted only 13.6% of their passes from the central attacking portions of the field, while 64.3% of their passes came from the wide attacking areas. Portland, by contrast, attempted 18.9% of their passes from the central areas, and 58.6% of their passes coming from the wide attacking zones. Real Salt Lake took their chances against Portland's flank defense rather than try to fight through Will Johnson and Diego Chara. The gambit worked well, as all eight of RSL's key passes and assists came from wide positions. 2. Kreis opts for the 4-2-3-1? 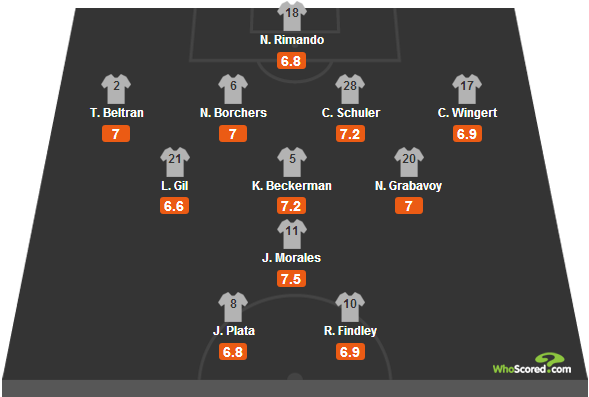 Beckerman and Yordany Alvarez were deployed in a double pivot at Los Angeles a few weeks ago, and while the results were not exactly convincing, it perhaps implies (or at least I'm inferring) that Kreis may want to take a more conservative approach on the road in the playoffs. 3. Ryan Johnson or Frederic Piquionne? Ryan Johnson has put in a workmanlike effort thus far in the playoffs, but with his playing time diminishing each game (83 min @ SEA, 69 min v SEA, 59 min @ RSL) and Piquionne finally healthy (and able to leap clear over Nat Borchers), it may be time for Piquionne to crack the starting lineup.